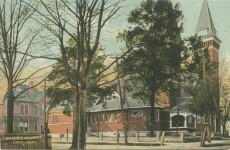 The first Baptist church organized was in the Fork. William Adkins and Lemuel Fields were among the first members. The next was Antioch, near Mt. Meigs. Green Pinkston, John and Isaac Ray were among the first members. 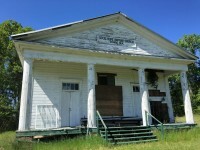 Note from Wikipedia: The Antioch Baptist Church in Mount Meigs, Alabama (an unincorporated community in Montgomery County, Alabama) was founded in 1818 and is the first Baptist church in the county. 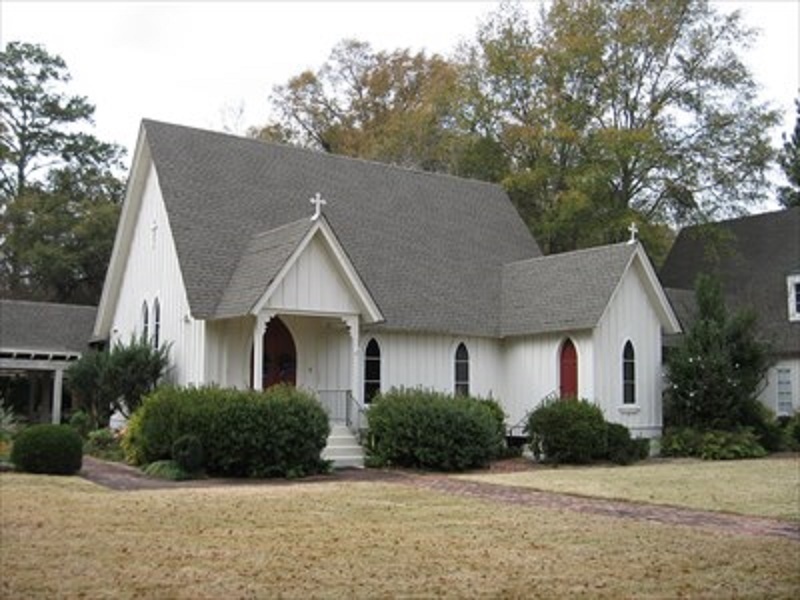 Originally a rural white church, from 1849 until the Civil War it was a biracial church; since then, the church has moved and has become an African-American church. The old church site now has only a graveyard, the Antioch Cemetery. 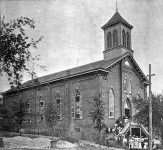 Antioch Baptist Church was founded by James McLemore, who also founded the Elam and Bethel Baptist churches in Montgomery county. 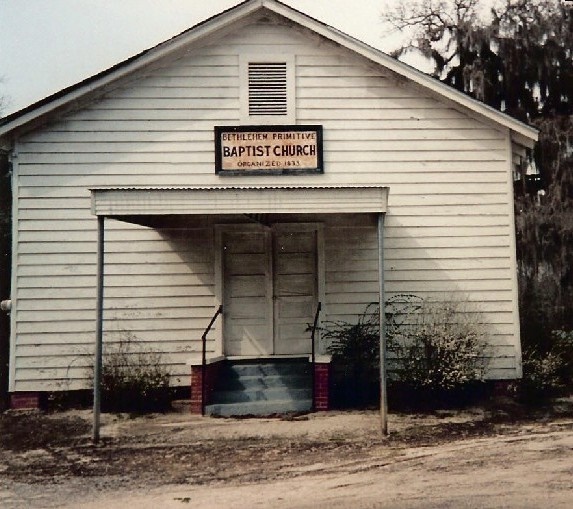 Antioch’s first church building was located on Atlanta Highway, east of Montgomery, on land donated by a Mr. Billy Wright. 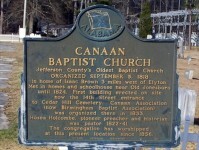 With the churches of Old Elam (also called Elim), Bethel, and Rehoboth, it formed a coalition which in 1819 founded the Alabama Baptist Association. 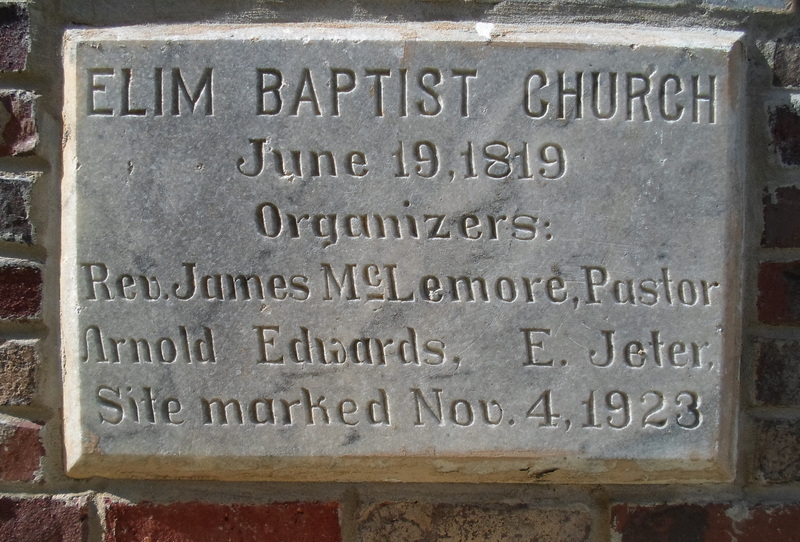 McLemore’s associate preacher was an African-American slave, Caesar Blackwell, who had been bought by the ABA for $625 to preach to a mixed (black and white, slave and free) congregation. Blackwell’s wife and child were owned by McLemore; apparently, Blackwell was a gifted preacher who could draw a mixed crowd and until 1835 was allowed to keep the income he generated from his preaching. Besides McLemore, Fielding Bradshaw was a pastor in its early days. By 1839 it had 132 members. 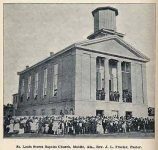 Though the church was a white rural church, in 1849 it accepted around forty black members, through baptism, and the next year sixteen more. Around that time the white members left but kept the property, leaving a white pastor (A. T. M. Handy) in charge. Handy ordained seven colored deacons in 1854. Until the Civil War the church was biracial; after the war (and in contrast to what happened in many other congregations) the white members left, leaving a black congregation; Antioch remains a black church. The first black pastor was ordained around 1882. The old church was torn down and a new church built nearby, still in Mt. Meigs. Only a neglected cemetery that remains from the old church. The next was Elam. William McLemore and a man named Breedlove were among the first members. The next was Bethel, on Pintlala creek. Note: You can see a history of the Bethel Baptist church in a video at their website which also gives a wonderful history of Baptist history in Montgomery, Alabama. The cemetery has been well-preserved. 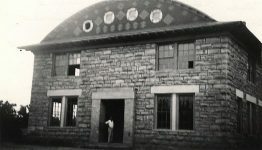 The next was Bethlehem, in the southwestern portion of the county, and the organization is still in existence. Note: Bethlehem Primitive Baptist Church Cemetery – A virtual Cemetery has been created by Cheryl Oliver on findagrave.com Bethlehem Primitive Baptist Church Cemetery in Bethlehem, Montgomery County, ALBethlehem Primitive Baptist Church Cemetery is actually located at 13956 Butler Mill Road in Lapine, Montgomery County, Alabama 36046. GPS Coordinates: Latitude: 32.05568, Longitude: -86.34318. 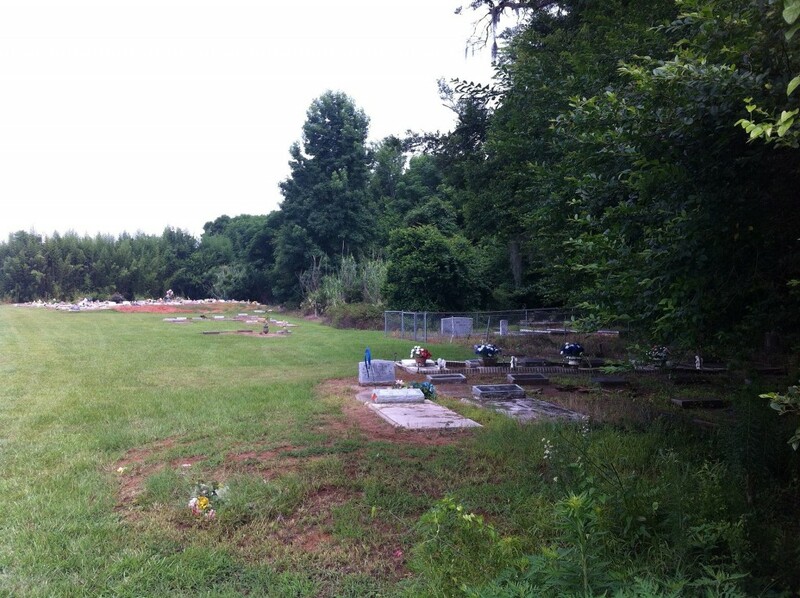 There are over five acres of graves in this cemetery. The people who maintain it have left information boxes, which are located at each entrance gate and is very helpful. The next was Liberty, at Carters Hill. The next was Mt. Pleasant. Laban Underwood, Mr. Evan, Bright Surles, Hardy Robins, and Bryant Walters were among the first members. The first Methodist church in Montgomery county was established in the fork, with Bernard Young preacher in charge. The next was in 1822 at the old Westcott Grave Yard on the Mobile Road, two miles from the city, and was afterwards moved into the city. 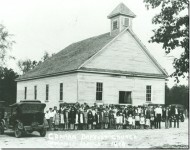 Prior to the year 1823 there was a Methodist church near David Graves, then in Montgomery county, but now in Lowndes. The Graves and Stones were among its members. The next was Hopewell, near Robertson’s X Roads, with George Powell and Michael Elsberry members. The next was Bethel, in Township 16, Range 20, with the Gilmers, Barnetts, Howards, and Mathews as members. The next was Mt. 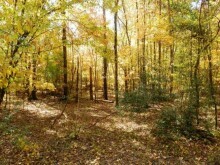 Zion, near the plantation of Peachy Gilmer, and afterwards moved to Mt. Zion Road with Reuben Emerson and family, James Miller and family, David Campbell and wife as members. The next Tabernacle, with Rev. Joshua Starr, as preacher, with John Elsby, Mr. Ledbetter, John Bonham, George N. and John Gilmer, members. i saw this church on the PBS show about ancestor, Finding your roots or something like that. Notice the name E. Jeter, yep, Derek Jeter’s ancestor. somebody know what’s behind the naming of “New Convert?” I pass the turn-off sign for this every time I go to B’ham via Jemison. What’s up with that name???? Any information on the first settlers of Alabama, The Stracner family? I’m doing research and it looks like our family was one of the first. His name would be helpful. Connie Jones 4th great grandfather. 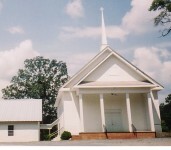 I would like to know if anyone knows about a church in Samantha, Al. (Tuscaloosa County that was called Shady Grove? And another one in the same area called Philadelphia Baptist. There are so many references to churches and cemeteries in the fork. This fork must be the intersection of Mt. Meigs Rd. and Wares Ferry Rd. in Mt. Meigs. This would be the intersection of US80 and Montgomery County Rd. 74. 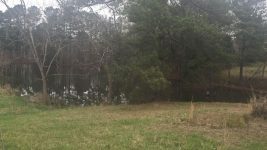 This is where the Antioch Church and cemetery is located. The church is gone of course but the cemetery as you see in the picture is still there. The sad part about this cemetery is that the historical part or oldest part is not very accessible. There are many old headstones back in the overgrown areas that spread for many acres. Some of them you can tell were ornate with brick and stone walls with wrought iron gates and fences. A few attempts awhile back were made to clear out this area but still could use more.